The following code prepares the data and automates generation of diffuse initial values for monitoring convergence of the MCMC sampling algorithm. JAGS/BUGS code defining the model is contained in: price_et_al_2018_jags.R. This file is the JAGS/BUGS code defining the model in: Price, Freytag, Bonner, Drayer, Muncy, Hutton and Barton (2018) Mountaintop removal mining alters stream salamander population dynamics. 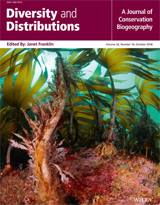 Diversity and Distributions 24:1242-1251. Aim: Population dynamics are often tightly linked to the condition of the landscape. Focusing on a landscape impacted by mountaintop removal coal mining (MTR), we ask the following questions: (1) How does MTR influence vital rates including occupancy, colonization and persistence probabilities, and conditional abundance of stream salamander species and life stages? (2) Do species and life stages respond similar to MTR mining or is there significant variation among species and life stages? Location: Freshwater and terrestrial habitats in Central Appalachia (South‐eastern Kentucky, USA). Methods: We conducted salamander counts for three consecutive years in 23 headwater stream reaches in forested or previously mined landscapes. We used a hierarchical, N‐mixture model with dynamic occupancy to calculate species‐ and life stage‐specific occupancy, colonization and persistence rates, and abundance given occupancy. We examined the coefficients of the hierarchical priors to determine population variation among species and life stages. Results: Over 3 years, reference sites had greater salamander abundances and were occupied at a much higher rate than streams impacted by MTR. At sites impacted by MTR mining, most salamander species and life stages exhibited reduced initial occupancy, colonization rates, persistence rates and conditional abundance relative to reference stream reaches. Furthermore, the rates in MTR sites showed low variance, reinforcing that species and life stages were responding similar to MTR. Main conclusions: Salamander populations in landscapes modified by MTR mining exhibited significantly reduced vital rates compared to reference sites. Yet, similarity in responses across species suggests that management or restoration may benefit the entire salamander assemblage. For example, reforestation could reduce landscape resistance, repair altered hydrologic regimes and allow for higher rates of colonization and persistence in streams impacted by MTR.